Is the Low Volatility Regime Breaking? Global central banks (US, Europe, Japan) have been flooding the markets with liquidity, essentially writing a put on the market. Markets have become less riskier thanks to increased regulations after the 2008 global financial crisis. Investors have a new-found enthusiasm for “SIP it and forget it.” This, plus the NPS bid, has cushioned the NIFTY 50. Increased liquidity in the derivatives market has allowed investors to buy volatility, thereby reducing the need to decrease risk by offloading equities in the cash market. The majority government at the center has provided policy certainty and political scams have not paralyzed decision making. Narratives can change overnight. And if the last few months have taught us anything, the market drives the narrative. Also, new investors have only seen a low volatility environment and think it to be “normal.” So any reversion to the old volatility regime would be a rude awakening. Are we really in a new world or is volatility about to revert to its longer-term mean? Code and additional charts on github. Also read our Volatility Collection. Stocks and Bonds are not correlated. They are not negatively correlated. And neither are they positively correlated. One doesn’t “zig” when the other “zags.” This is exactly why portfolio allocations start with stocks and bonds – the diversification math works on uncorrelated asset classes. When you combine the two assets together you get lower portfolio volatility. Previously, we saw how different country indices performed relative to their deepest drawdowns. Peak drawdowns only tell half the story. 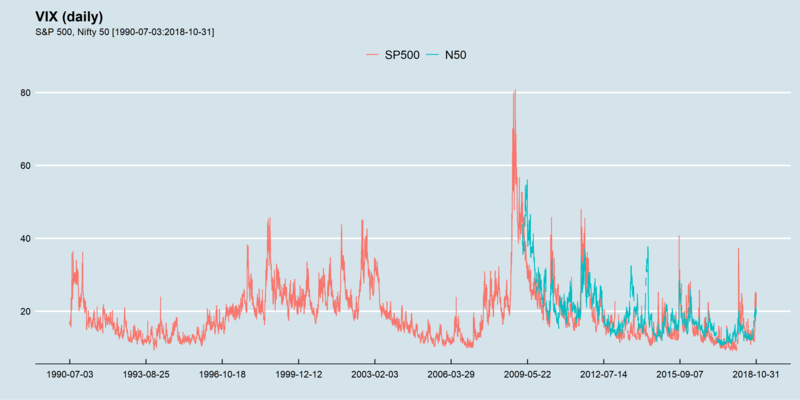 Here, we look at historical volatility. To keep things simple, we will define volatility as the standard deviation of daily returns. i.e., close-to-close volatility. The country-ticker key can be found here. The year 2017 was uniformly a low-volatility year. So were 2005 and 2014. 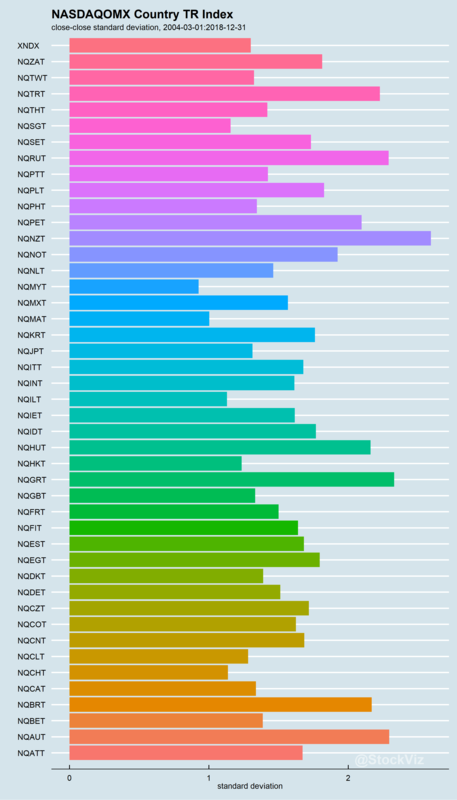 Some countries, Greece (NQGRT) for example, have been extremely volatile. Some, Malaysia (NQMYT) for example, have been surprisingly less. India (NQINT) has been middle of the pack. Source: NASDAQOMX data from Quandl. Please read Part I for the introduction. 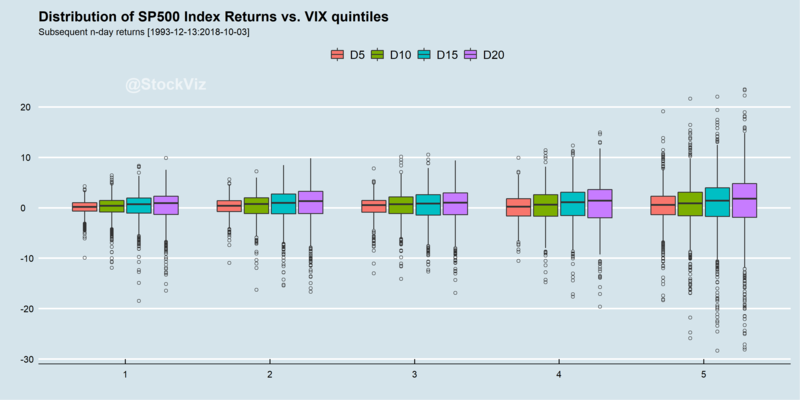 In Part I, we ran a quick back-test that would go long the equity index if the VIX was in a certain quintile and saw how the 5th quintile produced the lowest draw-down returns. The index was held only for a day. 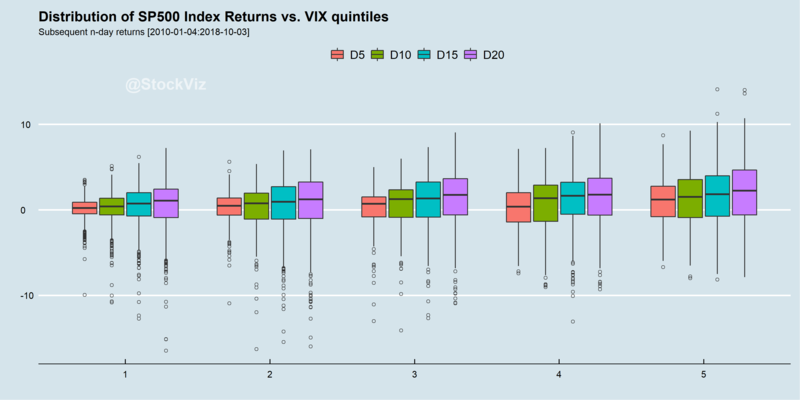 However, our box-plot of VIX quintile vs. subsequent n-day returns begs us to look at alternate holding periods as well. What would the returns be if we held onto the index beyond a day? 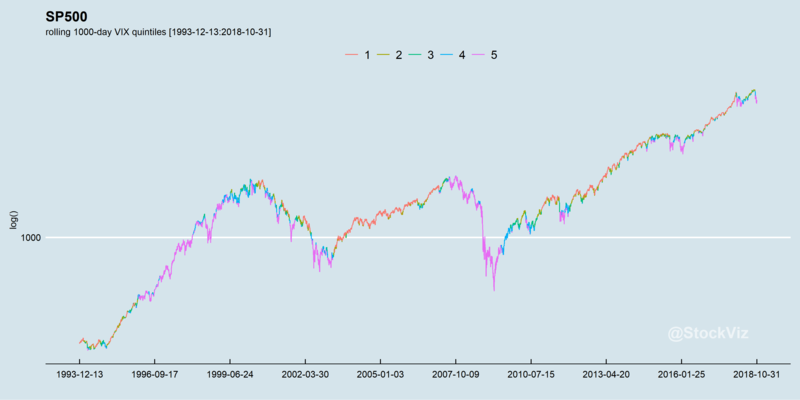 What happens if we used the change in VIX to time the equity index? There is no determinable pattern here. Perhaps the VIX and the index are co-incident with none holding the power of prediction over the other. 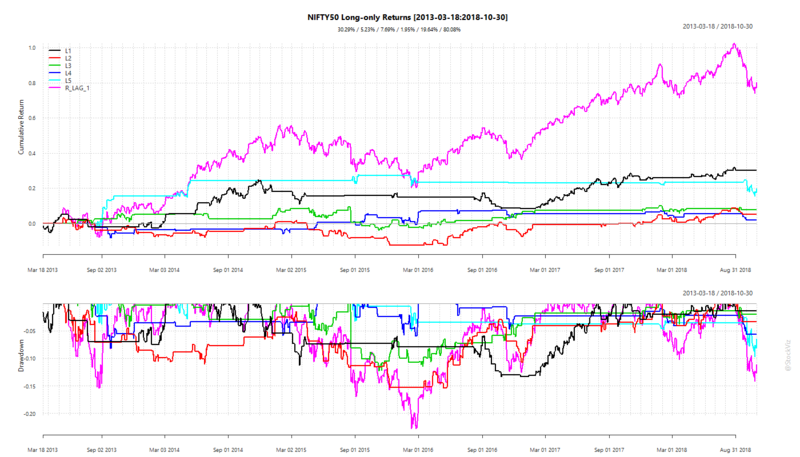 Interested readers can browse the github repo for corresponding Nikkei 225 and NIFTY 50 charts. The VIX is a measure of implied volatility of the underlying index. 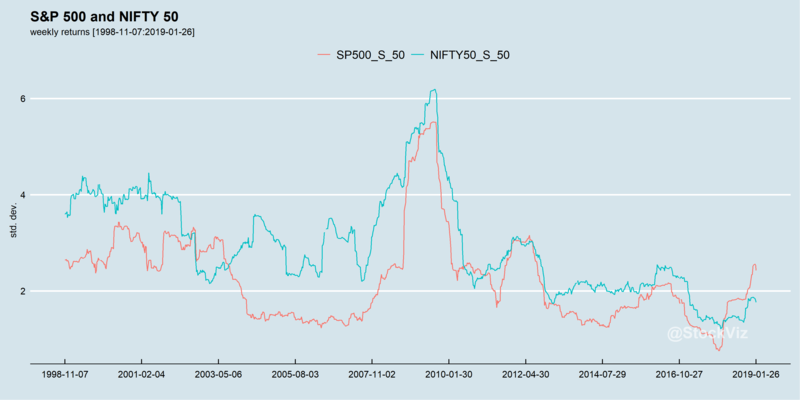 For example, the CBOE Volatility Index is a measure of 30-day expected volatility derived from S&P 500 Index call and put option prices, India VIX similarly uses the NIFTY 50 call and put options prices to derive a measure of volatility. 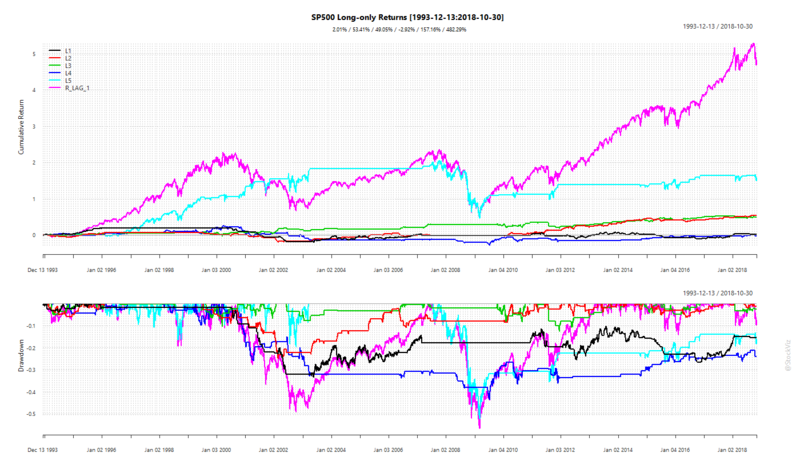 The question we will try to address in this series of posts is whether the VIX can be used to time entries and exits on the underlying index. The VIX on S&P 500 has been around since the 90’s whereas India VIX started out around 2009. 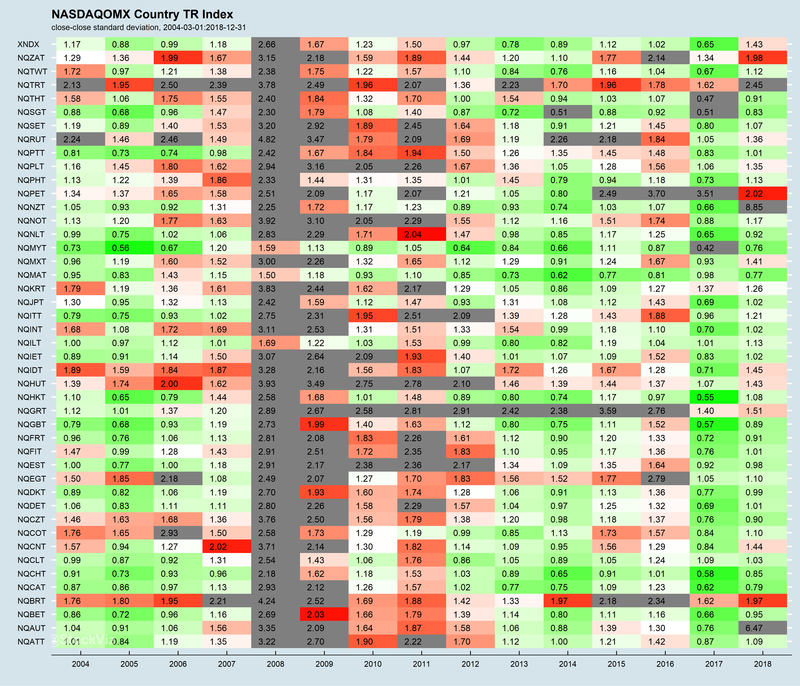 Moreover, the US enjoys a much wider and deeper market for volatility products than any other market in the world. VIX futures, VIX options, VIX of VIX, volatility ETFs and their inverse, all trade fairly well. Whereas in India, even though VIX futures have been listed for a while, it rarely trades. 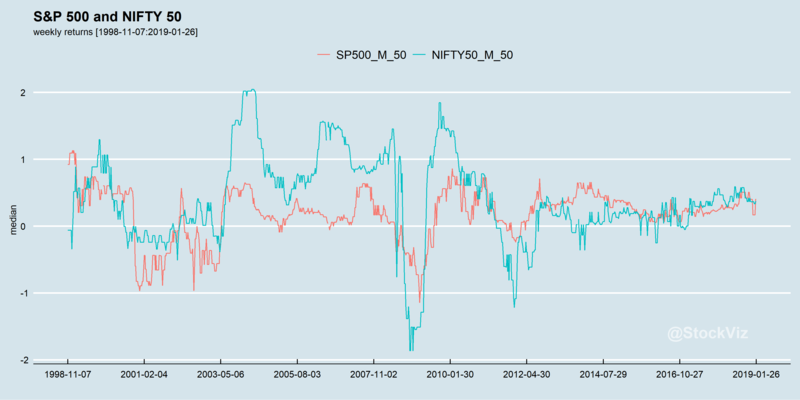 Trading activity of a derivative (VIX, in this case) invariably has an effect on the underlying (S&P 500, NIFTY 50…) So we expect the relationship between S&P 500 VIX and the S&P 500 index to be closer than that between India VIX and the NIFTY 50 index. 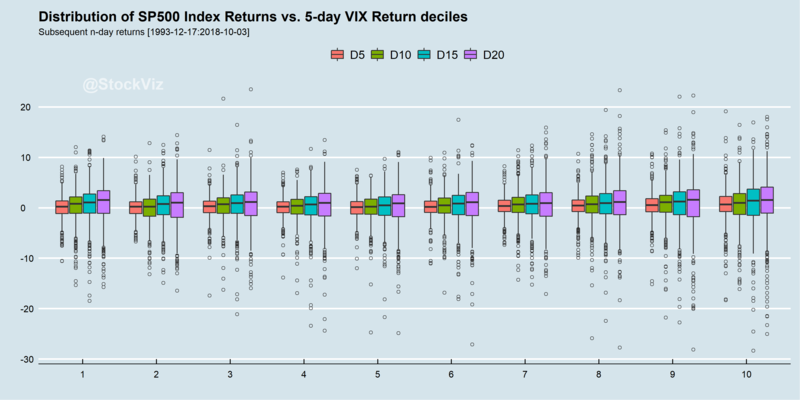 To begin, we will bucket the trailing 1000-day VIX closing prices into quintiles and observe the next 5, 10, 15 and 20-day returns of the underlying index over them. 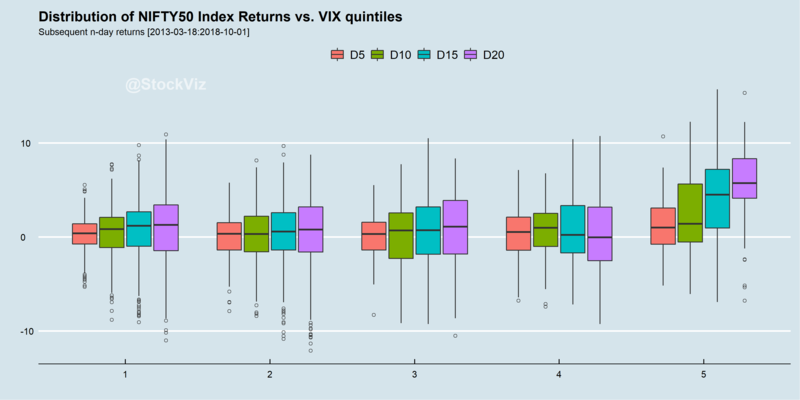 What is striking here, is that subsequent returns off the 5th quintile (when VIX is at its highest) is higher with smaller negative outliers than returns off the 1st quintile (when VIX is a its lowest.) This is counter-intuitive to the notion that “volatility begets volatility” so investors are better off staying away from the market when it is volatile. 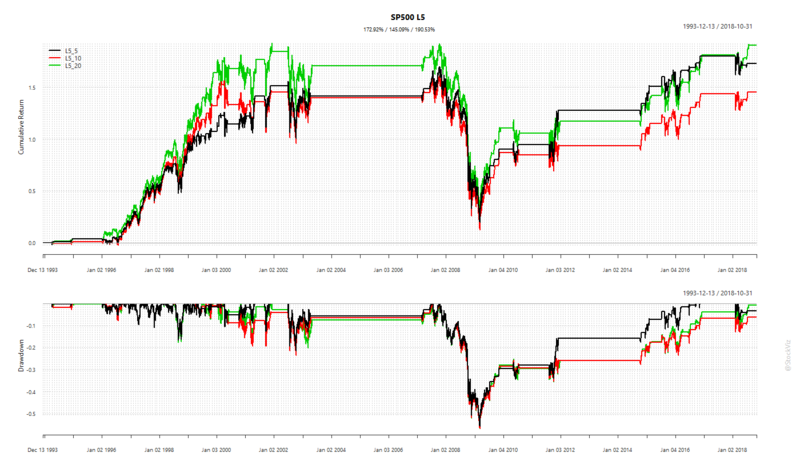 *Smaller sample compared to the S&P 500 dataset. What happens to a long-only portfolio if it is long the index only when the VIX is within a particular quintile? The strategy that is long when VIX is in the 5th quintile (L5) out-performs the other quintile strategies. Also, if you ignore the 2008 collapse, L5 has the shallowest of drawdowns. Cash-only investors can point to the superiority of buy&hold compared to these VIX-based strategies. However, the shallow drawdowns exhibited by the L5 strategy (long index when VIX is in the 5th quintile) is attractive to leveraged traders. For example, NIFTY 50 futures leverage is between 8x and 10x. So even if you play it safe and leverage only 5x, L5 returns would end up at ~100% compared to buy&hold’s 80% over the same period. We will dig deeper in the next part of this series. Stay tuned! Code and more charts are on github.